The former Scotland captain, from Bishopbriggs, received the Outstanding Achievement in Sport Award at last week’s NRS Scottish Sporting Awards. He received the award, sponsored by Ennova Law, at a glittering ceremony hosted by the Nordoff Robbins Scotland charity at Prestonfield House in Edinburgh. Bishopbriggs born and bred, Kellock captained Glasgow Warriors to the Pro12 for the first major trophy a Scottish side have won in the professional era, cementing his name firmly in the history books. After making his debut for Glasgow in 2006, Al went on to captain the Warriors for almost 10 years, making over 158 appearances for the team and inspiring countless teammates. Playing as a lock for Edinburgh Rugby, Glasgow Warriors and achieving 56 caps for the national team, his legacy has been hailed as a longstanding and a remarkable example to players hoping to follow in his footsteps. 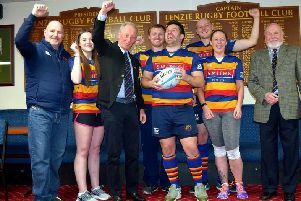 Despite his playing career finishing in 2015, Al has continued to support the game he loves as the Scottish Rugby Union’s business development manager. He said: “It’s great to get an award like this; the work Nordoff Robbins Scotland do is phenomenal and I really thank you all at the charity for the work you’re doing. “ I’m a big sports advocate so when you mix sports and charity like this the result is just great and the real aim is to get every kid in Scotland trying a sport. Other winners at the awards included football goalkeeper Gemma Fay and rugby player Stuart Hogg who were named Sports Woman and Sports Man of the Year respectively. The Scottish men’s hockey team won Team Performance of the Year, cyclist Mark Beaumont was Sporting Ambassador and para-skiier Millie Knight and her guide Brett Wild, from Bearsden, won the Sporting Teamwork award.